Our first encounter with the XXth century history of our region was through traditional songs: our hearts discovered what our minds did not yet know. The SOSAT Choir has taught us things that cannot be found in books. Tradition is a much wider world, reaching as far as our deepest feelings and emotions and continuing to resonate with us. At the beginning of the XXth century, the population of Trentino was still under the Austrian-Hungarian Empire. And our choir? It didn’t exist yet. Maybe it was an embryo in the womb of Club Armonia, founded in 1904 as a big mandolin orchestra, which included some of our future choristers. In the 1920s, it became the most important amateur group in the town of Trento. We were de facto citizens of the Austrian-Hungarian empire, but not in our hearts. Almost all our grandfathers wrote in Italian, but during the First World War, when many of them were killed, they carried the typical square backpack that was part of the Kaiserjaeger uniform. We don’t know where many of them died, nor how, nor why. This is why, when, as children, the mid-century generations heard the alpini singing about suffering, hope and death, these songs had resonance. At the end of WWI, the Trentino region was facing a terrible crisis: its territory had been devastated, its youth slaughtered, and the population had to adjust to the Italian administration. 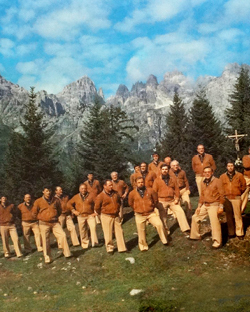 In this situation, Nino Peterlongo – a man of honour, whose moral fortitude was rarely to be found in future generations – decided to establish, in 1921, the worker’s section of the Tridentine Mountaineers Society: SOSAT (Sezione Operaia della Società Alpinisti Trentini). The aim was to help people discover the mountains and to forge a popular alpine culture. Up until then, mountaineering had been the prerogative of aristocrats and the lucky few who could afford it. SOSAT introduced mountains into the public imagination of ordinary folk and made them the symbol of a new Trentino. Nino was not only the founder but also the first president of SOSAT. Popular songs were around long before the SOSAT Choir, which was set up five years later, in 1926. Since its inception, the choir has acted as the interpreter of a tradition which the written word fails to capture. Popular songs are not simply testimonies of our history, but of hundreds of lives that experienced the tragedy of the WWI; they are the “soundtrack” of our entire past. Mountain songs have become an important feature of our regional identity, making Trentino a “singing” land.